This one is for the ladies, which….most of this week’s posts will be for the ladies, so I guess it’s Ladies week. Fun Fact: I’ve heard some women say this before, they are scared to dive when they are on their monthly cycle because they don’t want to attract sharks. “First, rest assured, that there is no evidence that women are at an increased risk for shark attacks if they are menstruating. 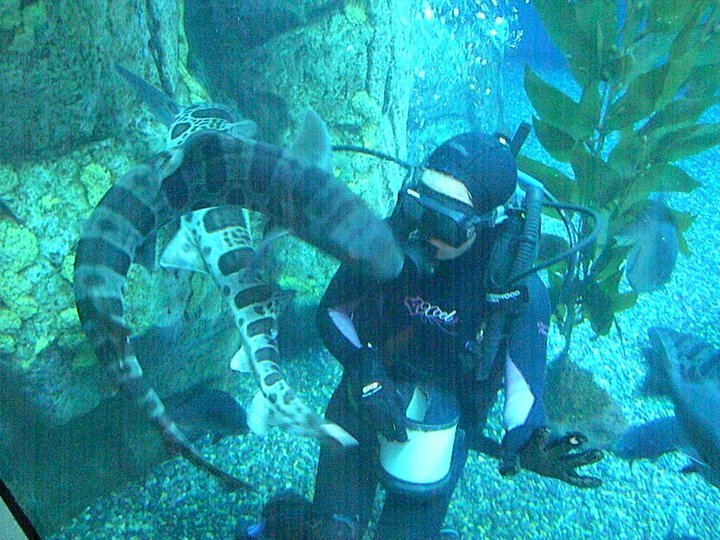 Think this Leopard shark likes me for my personality? And here is the source article from DAN, discussing many other interesting women’s health issues and diving, including breast implants, pregnancy, ovarian cancer, Birth Control Pills, and just in general some important health information for women divers.